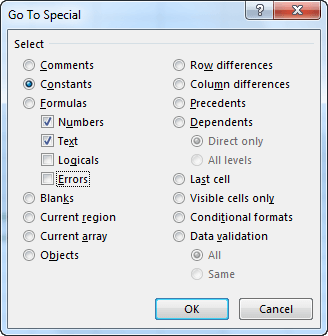 Go To Special tool is used in Excel to find data of a specified type. For example formulas, text, constants, blank cells, etc. Look at the following example. This table consists of different types of data. Let’s search for cells containing standard text and numbers. In order to do this, go to HOME >> Editing >> Find & Select >> Go To Special. If you select a range of cells before you select Go To Special, Excel will only search those cells that are inside this range, otherwise, it will search inside the entire worksheet. Select Constants: Numbers and Text, then confirm by clicking the OK button. These are not errors. Cells B5 and D2 are not constants but formulas. Cell B4 is a date, but dates in Excel are stored as numbers. Use the Ctrl + ` keyboard shortcut to show formulas and values. Now, you can see that Excel selected the correct cells.